This post may contain affiliate links that support our family and our blog and podcasting efforts. Over the past several months, I’ve been learning more about grief than I ever wanted to know. I’ve also learned things about myself, both good and bad, but hopefully all lessons to make me a better person and friend in the long run. That said, a common thread in many situations of great loss is anxiety. Sometimes that shows up in panic attacks. It has even been said that the “stages of grief” should actually be changed to include anxiety in order to help people going through it. Most grief counselors and books on grief will remind us not to turn to alcohol or other dampening substances to help us through, but when presented with symptoms of anxiety, doctors will often prescribe a Xanax or Valium (or other anxiety reducing pharmaceuticals). Since both alcohol and these psychotropic medications can have side effects, addicting properties and negative long term consequences, it is always better to try something a little more natural as a first line of defense. And actually, some of these remedies have been shown in studies to be as effective as some prescription drugs! 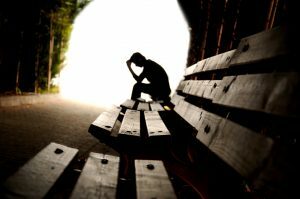 *Tip: If you are having severe anxiety while processing grief, this is NORMAL, you are not alone and grief counseling can help. *Disclaimer: It is not a bad idea to get anxiety symptoms checked out by a functional physician, just to rule out any other possible health issues. And always check with your doctor before beginning any supplementation, particularly to insure that there are no contraindications with current medications. Recommended Supplementation: 1-2 cups a day in tea (made with 2-3 tsp dried chamomile flowers), 350-500 mg in pill form (found here), or in a tincture (amts depend on concentration). 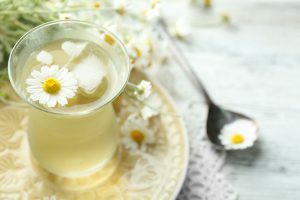 Avoid: Though generally considered one of the safest teas to consume, people with asthma, pregnant women and people with allergies to ragweed or the aster, daisy or sunflower families of flowers should not take chamomile. Another plant based remedy used regularly for centuries, valerian root is known for improving sleep and decreasing anxiety. Recently, scientists have discovered that this root increases the amount of the chemical called GABA in the brain. GABA (gamma aminobutyric acid) is responsible for regulating nerve cells, among other things, and thus calms anxiety. 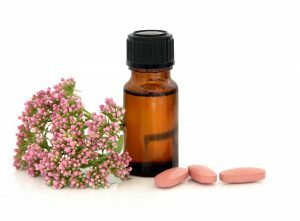 (Source) As a bonus, valerian is also known to ease PMS cramps, lower blood pressure, and ease stress. It has calming properties, so it is best to take shortly before bed only and not with any other herbal or medicinal sedatives. 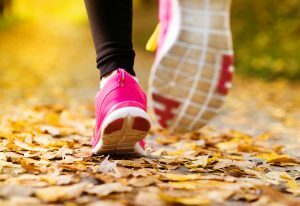 Recommended Supplementation: Especially when experiencing grief, it is a good idea to get a trusted friend to invite you to exercise and help you stick to it. The evidence shows that the best results come with 21-30 mins per session, 3-4 times per week, with moderate intensity, for at least 16 weeks. Essential oils are basically the natural oils in plants but very highly concentrated. They have been used for centuries in a variety of ways. 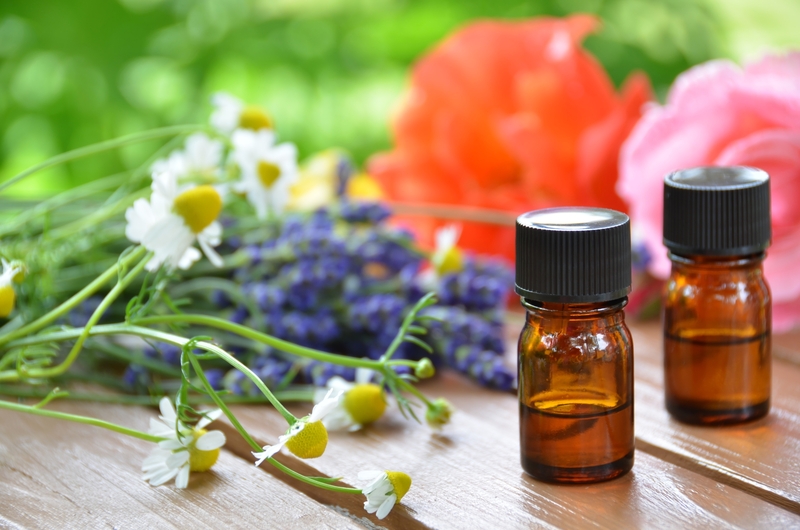 The most common use of essential oils therapeutically is aromatherapy, which can include diffusing, misting, and topical application (with a carrier oil). There have been many studies that have shown the benefits of different oils for reducing anxiety and depression. The top oils generally recommended specifically for anxiety are: lavender, rose geranium, Roman chamomile, clary sage, bergamot, frankincense and ylang ylang. Recommended supplementation: Diffuse any of the above oils daily, alternating between your favorites; make a massage oil of sweet almond oil with a few drops each of lavender, bergamot and frankincense oils and rub into hands and forearms daily. First adapted from yoga breathing styles by Dr. Andrew Weil, this “Relaxed Breathing” technique has been shown clinically to work as a natural tranquilizer for the nervous system. According to Dr. Weil, while the calming effects of this breathing can be felt immediately, with regular practice, the voluntary deep breaths can lead to new involuntary breathing patterns that are beneficial for reducing the body’s inflammatory response to stress hormones. Empty your lungs with an exhale and then inhale through your nose deeply in 4 counts. This is one cycle. Do this at least 3 times. Recommended Supplementation: Regular practice, at least twice daily, over a period of 8 weeks. Sessions should include at least 3 cycles and has no other limitations. 6️⃣ Eat. But try to make it healthy food. Especially in times of grief, eating can be a huge chore. It can be so much easier to either skip meals or eat fast convenient foods. Unfortunately, this can greatly increase anxiety. Meditation is an ancient practice of focus, breathing and mindfulness that takes many forms. It can be an emptying or filling of the mind, deeply concentrated prayer or even simply focused breathing. 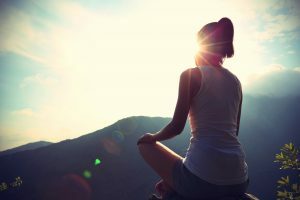 For some, guided meditation (via youtube or meditation apps) is enough to help reduce the physical reactions to anxiety. For others, something slightly more is needed. For these purposes, we will be referring to a technique that has been studied for a while in clinical psychology called “Mindfulness-based Stress Reduction“. Simply put, it is a program that allows people to find the space between stimulus and response and create more focused choices in their lives. For more information on this and a free online course, click here. Phosphatidylserine (Foss-fuh-tide-el-sear-een) is a naturally occurring fatty substance that covers and protects the cells in your brain and carries messages between them. 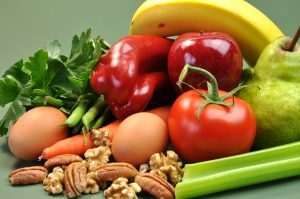 It is found in low levels in most natural foods, like egg yolks, most fish, chicken, white beans, soy and sunflower lecithins and most notably, cow brains (not recommended for consumption due to mad cow disease) It is typically used supplementally to naturally treat symptoms of Alzheimer’s, Parkinson’s, ADHD, depression and to enhance athletic performances. While not typically used to treat anxiety, it has been shown to reduce serum cortisol in chronically stressed individuals. (source) Cortisol, released by the adrenal glands, often referred to as a stress hormone, typically is higher in the morning, can fluctuate during the day, and lowers at night to allow sleep. During stress or grief, cortisol can be released in excess and remain high in the body for long periods of time. This can lead to sleep disruption, lower immune response, inflammation in the gut, systemic circulatory system damage, and the dreaded belly fat. Recommended Supplementation: It can take up to a couple weeks to see real results of supplementation, so this can be a secondary or more long term remedy with the added bonus of general brain health. In pill form, 100-400mg/day, taken morning and noon. Because it effects cortisol, if taken at night is can cause insomnia. Amino acids are the building blocks of protein (which basically is 75% of our bodily structure, including many of our tissues and cells). In general, amino acids effect every single human function, from controlling serotonin levels to keeping the gut lining healthy, (and so many more). We get some amino acids from our body and some only from foods, with animal proteins containing the highest amounts. Targeted individual amino acid supplementation can have amazing effects. L-Theanine– Present in green tea, this is thought to be more effective combined with caffeine. In some studies it has been shown to reduce anxiety fairly quickly. Recommendation: drink green tea daily to generally decrease stress symptoms, supplement with theanine in cases of acute anxiety. Some cautions can be found here. Here are a couple of free questionnaires to help determine which amino acid might be better for you. These include GABA, glutamine and tryptophan, among others. Magnesium is used in over 700 metabolic processes in the body and even has some interaction with the gut microbiome. A deficiency in this essential element can lead to many mental health symptoms, including anxiety. 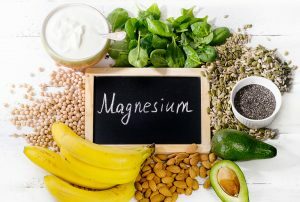 (source) It is depleted in physical and emotional stress and in fact, many people do not get enough magnesium in their diet to keep up with the body’s need in restful times. Magnesium is a calming mineral and is found in many foods and in epsom salts. Because of its ability to help regulate the nervous system, it can be particularly helpful to supplement during stressful times. Recommended Supplementation: If possible, increase consumption of foods high in Mg- dark leafy greens, kelp, almonds, cashews, avocado, pumpkin and sunflower seeds, dark chocolate, figs, black beans. Take epsom salt baths- warm water, 1-2 cups of salts, soak for at least 20 mins. Supplement with magnesium glyconate– 200-500mg/day.